PLUS ULTRE meaning “Más Allá” or in English, “Further Beyond”. In context, The motto of Spain is placed on the nations coat of arms (which appears on the country’s flag) means to explore beyond the straits of Gibraltar- meaning the Americas. 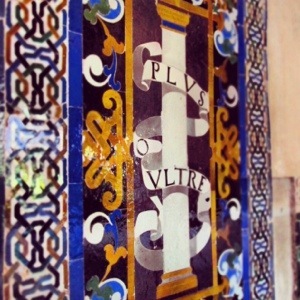 This motto was adapted by Charles V from the origional “No Plus Ultre” which means “nothing further beyond”, suggesting that there was nothing beyond Spain, that Spain was the end all be all. I cannot even begin to tell you how jealous I am Jenn! I love you and miss you! continue being safe and having a blast!